well, that was a flop. i definitely failed my budget challenge this month. we’ve had a lot going on, and i’m totally a stress shopper. with that said, i didn’t do that bad. i went over by about $30 when all was said and done. – anything I sell adds to my budget. i had $236.50 to spend. what i actually spent was $267.70. 6 / Express – to go along with my new skirt from Nordstrom, i picked up this cute lace top that i wore here. – don’t buy something immediately. wait a few hours or a few days. you most likely won’t “need” it anymore. – be picky! if you buy something and it doesn’t make you feel good, take it back. having things in your closet you never wear is not doing anyone any favors. – purge your closet! then take it to plato’s closet, sell it on poshmark, ebay it, donate it, whatever. get it out of there if you’re not wearing it! 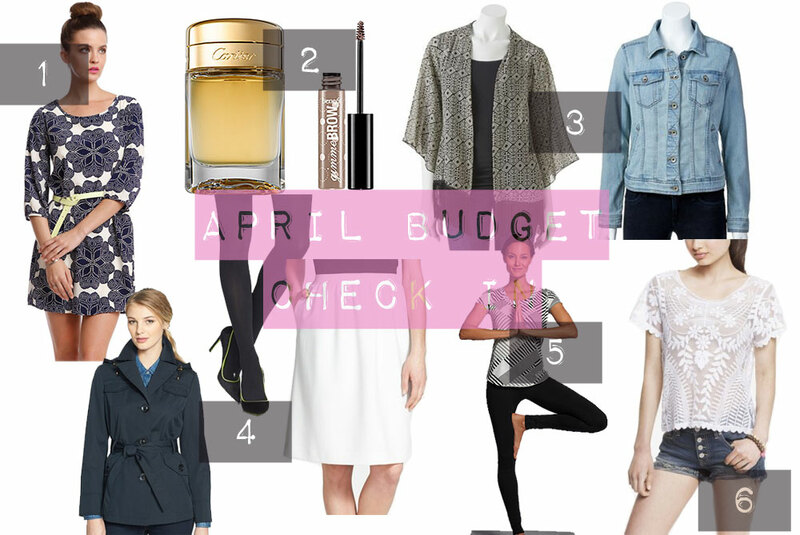 did you set a budget for yourself this month? how did you do? I really, really like the dress you got from Golden Tote! And your tip about waiting to buy something is very true–I often walk away from something and later I’ll know whether it’s really worth the money or not! Not buying something immediately is key for me! I have to be conscious of that. I am a total Veruca Salt I WANT IT NOW. I do love what you bought, and I don’t think you did too bad! You did fantastic! I cannot believe you returned the goodies you bought from Sephora. Now that is some dedication… or crazy guilt. What do you think of the Benefit Gimme Brow? I tend to gravitate to the Anastasia products, but will always try new things. Thanks for linking up wth Steph and I! it was a little bit of both – things i really didn’t need and guilt from overbuying because of the great discount! gimme brow is amazing – brow pencils scare me but this is perfect. what do you use from Anastasia? totally! as it starts getting warmer, i’m definitely going to another closet clean out too! You did pretty good! I have been trying to cut back on my spending in general – seems to be working well so far! Love the dress you got. I failed big time on the challenge too- wasn’t even worth a recap I did so terribly!